A popular complaint from those living in London (especially expats), is that the British capital lacks decent sushi. Sure, there’s at least one of the major sushi chains (Itsu, Yo!, Feng etc.) on every high street but those hardly constitute as good sushi, and it’s nowhere near the standard of what can be found in say, Los Angeles or Singapore, never mind Japan itself. However, if you know where to look there are actually a number of solid options for fresh, well turned out sushi (albeit often at a price). In my quest to uncover some of the best, I am slowly trawling through the city, sampling a string of Chirashi-zushi (raw fish laid over a bed of vinegared sushi rice) lunches at the most talked about sushi-dedicated joints, plus some lesser-known gems. So why chirashi? Besides being one of my favourite complete meals in one bowl, the assortment of sashimi and plentiful sushi rice is a good gauge of both the quality (and variety) of fish served at an establishment, as well as the skill of the chef in preparing and seasoning rice. To make my posts digestible I will be writing them in parts, each covering five restaurants at a time. 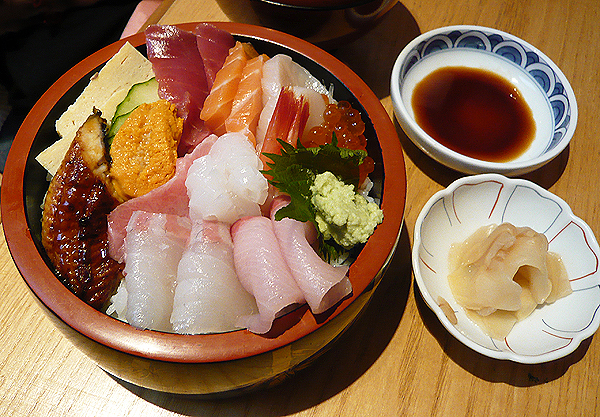 This first installment features Dinings, Defune, Ikeda, Chisou and Sushi of Shiori. The Chirashi lunch set at this tiny Marylebone restaurant specialising in modern sushi and Japanese tapas, came with a handful of edamame, miso soup, and a choice of a tempura or sashimi salad side (I opted for the former). Although not the most inspired selection of the lot, the salmon, maguro (tuna), mackerel, yellowtail and ika (squid) were all spanking fresh. The moist unagi (eel) was a welcome addition, but the other cooked item of boiled prawn was disappointingly bland. A vinegary chilli and onion sauce came alongside, and I mistakenly used it for my tempura (which incidentally was a touch oily, but very crisp) – turns out it was provided for the sashimi; as a modern alternative to the soy sauce that was also served. The spicy dip complemented the fish surprisingly well, and I particularly enjoyed it with the salmon. The glossy, well-vinegared rice grains had a nice bite to them, and the sesame sprinkled over lent a pleasing nuttiness. Good value at £15, and the extras are a nice touch – a good option if you’re looking for a little variety. Another restaurant offering a little more than just a bowlful of chirashi-zushi was nearby Defune. Their chirashi set was served with a simple salad (not pictured) drizzled with house dressing, agedashi tofu and miso soup. The deep-fried tofu was light and not at all greasy, but the delicate broth would have been much improved with more seasoning. The generously-cut sashimi were of excellent quality, but the rather large slices meant they were a bit awkward to eat. A slightly more adventurous selection which included turbot, tai (bream), chutoro (tuna belly), salmon, omelette and cooked prawns (sweeter and meatier than the ones at Dinings). The rice was perfect – tender, subtly vinegared and topped with a mix of sesame and toasted nori (seaweed). Punchier at £21.50, yet somewhat justified considering the higher grade fish on offer. If price was no object, then the £35 Chirashi Set A (a cheaper £28 Set B is also available) at this tempura and sushi restaurant would be my top choice. The soft, unadorned rice was expertly made and there was no faulting the impeccably fresh sashimi that almost overflowed from the bowl. Apart from the usual suspects of maguro, salmon, yellowtail, there was also turbot, scallops, snapper, amaebi (sweet prawns), otoro (the prized, fattiest cut of tuna belly), unagi, salmon roe, omelette, and my absolute favourite – gloriously creamy uni (sea urchin). The set came with miso soup and premium condiments of freshly grated wasabi (notice the difference in appearance to what was served with the Defune chirashi) and aged soy sauce. A decadent choice, which while not exactly value-for-money, is a worthy treat for a special occasion. 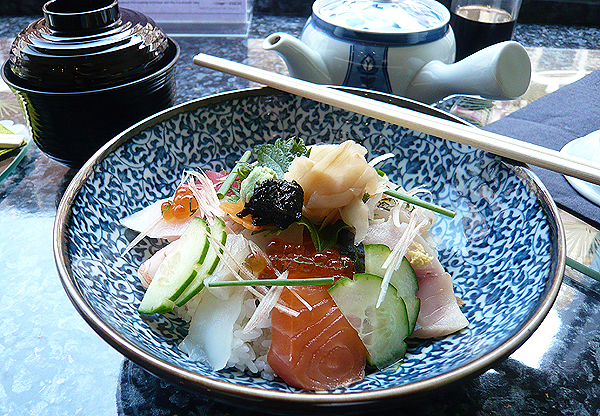 Equally packed with fish is the chirashi served at one of my regular haunts just off Regent Street – Chisou. It is priced at a more reasonable £24.50, and although this specific one does not boast sea urchin, the chosen fish changes according to market availability (and to an extent, the chef’s mood), so on certain days some uni may just find it’s way into your chirashi! No matter what the selection, the sashimi resting on the tasty sushi rice (it is scattered with marinated shiitake mushrooms and nori) is always abundant, and of great quality. 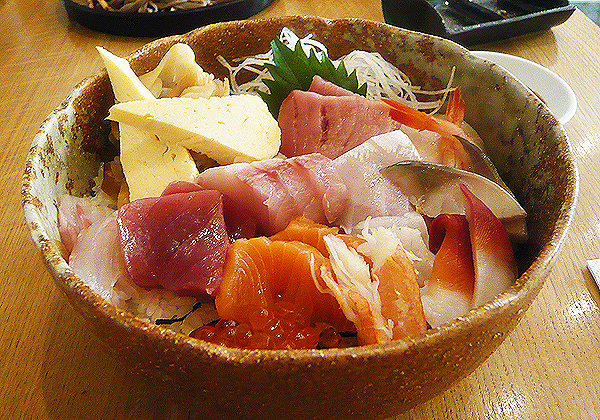 This particular bowl was brimming with maguro, chutoro, salmon, yellowtail, swordfish, tai, mackerel, surf clam, crab leg meat, turbot, amaebi, salmon roe and wedges of omelette. The only drawback is that it isn’t part of a set, so if it’s chirashi you ordered, that is exactly (and all) you’ll get. By far the daintiest chirashi I tried was the one served at this equally dinky 8-seater sushi bar in Euston. Run by an ex-Umu chef and his wife, this place does most of its business through orders to-go, but this is no mass market operation, like other run-of-the-mill sushi takeaways – the chef takes time and care when crafting his sushi creations – as apparent with my prettily presented chirashi. The sashimi was exceedingly fresh (they get their fish from the same suppliers as Umu) – a small piece each of mackerel, salmon, scallop, swordfish, tuna, horse mackerel, yellowtail, turbot, amaebi and sardine, as well as some salmon roe and artistically placed slivers of miyoga (a type of ginger), shredded shiso and nira (garlic chives). The nori and mushroom specked rice was still warm (as sushi rice should be) and well-seasoned but on the small side portion-wise. The serving size is the major gripe and could be easily remedied, but as it was I left not only £15 poorer but sadly, still hungry. A good showing for Round 1, with Chisou and Defune fighting it out for pole position in terms of quality, value and quantity. But Dinings can’t be discounted either, with its £15 set being pretty fantastic value (despite there being less sashimi). ~ by gourmettraveller on May 24, 2010. I am very grateful you’re doing this! I love sushi and have always wanted to know the best places in London. Although its not a dedicated sushi restaurant, Asakusa in Mornington Crescent has a mighty fine menu at basement prices. The sashimi is consistently fantastic, easily rates as my favourite cheap japanese in London. Haven’t had Chirashi-zushi there so you might want to check they do it, I’m sure they would. Definitely worth a look!! Asakusa sounds promising – will put it on the shortlist for part 3! Kiraku (not far from Sushi Hiro) also have chirashi sushi. Thanks Su-Lin for reminding me about Kiraku… how would you say it stacks up next to Sushi Hiro? Not bad, I reckon though I’ve not had the chirashi sushi at Sushi Hiro. Very keen to try Suzu since Oonth mentioned it further down the page – passed it a few times in the last couple of months and wondered how it was! Thanks for sorting me out with good places to go and get sushi. Nice post GT, I must try Ikeda at some point, it’s hard to find good [ie Hokkaido or California] uni in London. I would also like to try the revamped Sake no Hana menu, there is an ongoing 40% off offer by the look of things. I have been working near Saki these last few weeks and would recommend that you add them to your list. They do a daily bukkiri don for £13.50 and on Mondays, you can get it for £6.50 takeaway (go sit and eat next door in Pure Groove record shop/cafe/bar) which is a steal for the quality on offer. I was also impressed by a recent sampling at City Miyama (they also have a Mayfair branch) and plan to return one evening for sushi happy hour (all nigiri £1 apart from uni, toro, etc). Of the recs from other commenters, I’ve had poor experiences at Asakusa and Kiraku and I find Sushi Hiro perfectly OK but am not really sure what all the fuss is about. Also worth noting that Kikuchi and Asakusa don’t open at lunchtime. Thanks Oonth, very useful info. I’ve only been to Kikuchi at dinner so didn’t know they were shut in the day – in that case will substitute it with Saki for Part 2. Have heard the new Sake no Hana menu is a bit hit-and-miss, so we’ll see how it fares when I make it on over. Not heard of Miyama… will check it out. Let’s compare notes on Miyama/City Miyama when we’ve both visited/revisited. For Part 3, you might want to target Edokko (went once and was impressed), Mitsukoshi (one good experience and one less good one), Soseki (one excellent experience but seemed to go badly downhill), Kiku (has never really impressed me but lots of people speak highly). Atari ya is a very solid and very affordable option (£9.50 chirashi), they just opened a new sushi cafe in Swiss Cottage which handily is 10 minutes walk from my home. Someone below mentions Tajima tei, was there last week, verdict solid but nothing special. Looking forward to reading Part 2 and hopefully Part 3!! definitely want to do Eddoko and have been meaning to eat at Mitsukoshi for a while now, also agree that atari-ya would be a good budget option to throw in the mix. I wasn’t a fan of Kiku either and although I enjoyed Soseki when I went, I do believe they don’t do chirashi. Hmm… looks like I better get eating! Hi GT. Just an update to let you know that City Miyama is definitely worth a visit, I enjoyed a good evening meal there last week. Not all nigiri is £1 but between 6 and 7.30pm, most items are 30-50% off. Razor clams were particularly good. And some good sake (if that’s your thing) for sensible prices. I also plan to try Miyama Mayfair. Both places offer chirashi. Another place to try is Suzu @ 170-172 Hammersmith Road. Run by a pleasant and talented lady called Makiko who used to have a concession in Selfridges and then a cafe/restaurant of the same name on Charlotte Street. Excellent kaisen don for £12.50 (medium size portion mind). Seem to remember that you’re West London so quite a convenient option for you. May check it out next week (possibly the Mayfair branch as that’s closer to me). Suzu sounds good too… looks like I’ve got my work cut out for me! Great post:) Love all things Sushi! I love sushi and this looks gorgeously fresh. 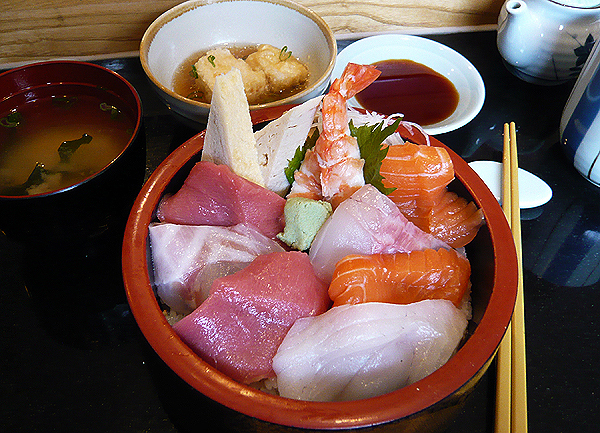 Check out tajima-tei in leather lane market off holborn near holborn circus…. I have to agree that asakusa is the only place you seem to have missed. It’s always been one of my favourites too. 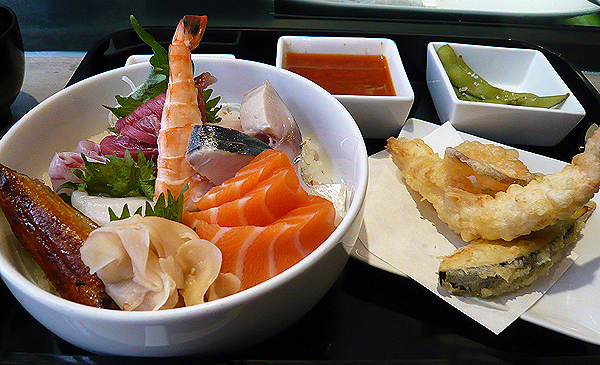 We always have chirashi at Sakana-tei on Maddox Street, off Regents Street. Fresh, delicious and filling (but I don’t think it’s part of a lunch set). Sakana-tei has long been a favourite of mine – their chirashi is set to feature in part 2 of my chirashi post series. Made a trip to Chisou recently (review now up) — the chriashi was great, though £24.50 instead of the £18.80 on their website – I wonder if they’ve recently increased prices, or evenings are different to lunch times? Agree about Sakana-tei – their chriashi is such good value, though shame about the minimum charge, esp when I’m feeling broke…. So glad you enjoyed Chisou. I hadn’t noticed a change in price but I went today and you’re right – have made the change in the post, thanks for bringing that to my attention! As for Sakana-tei, is the minimum charge not only for credit card payments?